Students and staff are anticipating a successful production of Arthur Miller’s classic drama, “All My Sons” this weekend. This is the first theater production of the 2018-2019 academic term from the Millsaps Players and will feature students, faculty and staff members. “All My Sons” was written in 1947 by American playwright and essayist Arthur Miller and is set in post-World War II America. It follows the Keller family: Joe (father), Kate (mother) and their two sons, Chris and Larry. Chris returned from the war a few years earlier, but Larry was lost in action and has yet to return. Issues involving Joe’s sketchy business dealings from the war and the return of Annie, Larry’s ex-fiance, problems arise in the family and those around them. 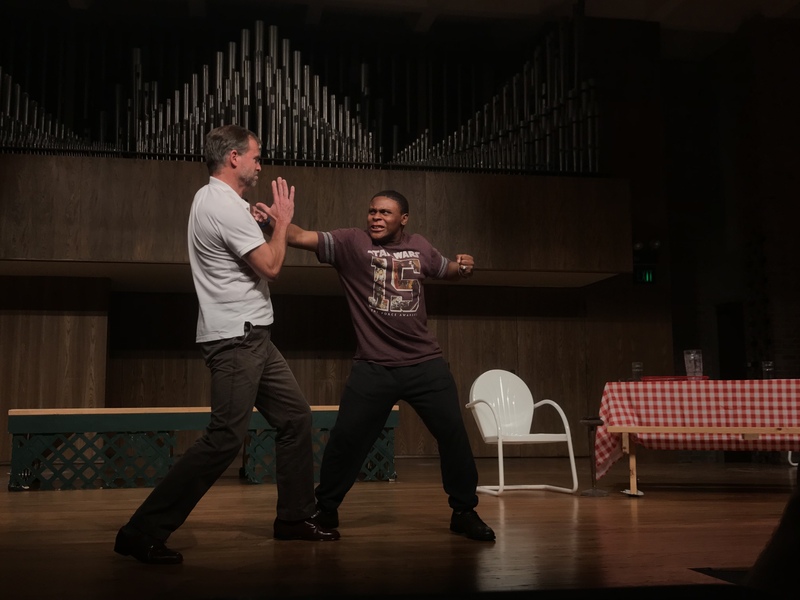 Theater productions have historically been done in the Christian Center, but for the past two academic years, due to the renovations to the Christian Center, the department’s events have been performed in the old Kava House across from the campus bookstore — a space that is rather small and does not accommodate well for the uses of theater productions as there is no backstage area. Dr. David Wood, Associate Professor and Chair of the Modern Languages Department, will take on the role of Frank Lubey, the kooky neighbor of the Keller family. Wood, described his character Frank as one who “studies the stars” and is often made fun of for his deep-rooted connection to the natural world. Wood relates this characteristic of Frank to his character in the classroom as a Spanish professor. “I connect with Frank. It’s like it is in my classroom: it’s just me, the Spanish language and the students who I get to teach. In both cases they think I’m a little insane but I’m really just passionate, and I have a lot of energy. In the play, I get a lot of crap for it, but I can take it,” he said. Wood went on to describe how Frank interacts with those around him in “All My Sons.” Frank has three kids and a wife in the play, but those characters aren’t really explored, he said. “Lydia, my wife in the play, can be kind of annoying. She interrupts my meditations and dismisses my belief in the stars. I’m an optimist and an idealist and many other characters aren’t like that.” He explained that Chris, one of Joe’s two sons, is a realist, and Kate, Joe’s wife, comes to Frank for looking to the stars for finding her never-returned son Larry. You can catch the Millsaps Players production of “All My Sons” this Saturday, Sept. 29 at 3 p.m. in the Academic Complex Recital Hall. The cost to get in is $5, and all proceeds are going to Mission 22, a nonprofit organization that helps to prevent veteran suicides and provides resources for veterans and their families.